Hope you had a happy and safe holidays! Bebe loves her gym! She is doing a good job of tearing it up, but she thoroughly enjoys her time on it! I am sure that I will have to order replacement toys in the near future! She also loves those little plastic Disney characters you included in the order! Bebe looks for her play gym the minute she is let out of her cage. She loves it there! I heard about you on-line. Google I think it was. 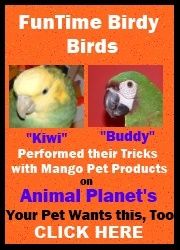 I did a search for parrot or bird gyms and your website was one of the websites that came up on my search. After researching yours and some of the other gyms, I decided to go with yours. I have attached some pictures of Bebe on her gym for you!